Over the winter holidays, I finished “The Quest”, brought to my attention by the Legend of Erthia creator. While it only recently appeared on Steam, it actually has a long history as a mobile game, having been available in the iPhone app store since 2009. There are several very favorable reviews for the app out there; I would not follow them completely, both because the competition on the PC is much stronger (if you are looking for classical CRPGs, I’d easily recommend Might & Magic X and Lords of Xulima over it) and because there are some peculiarities to the design that strike me as rather odd. This posting is about the latter part. 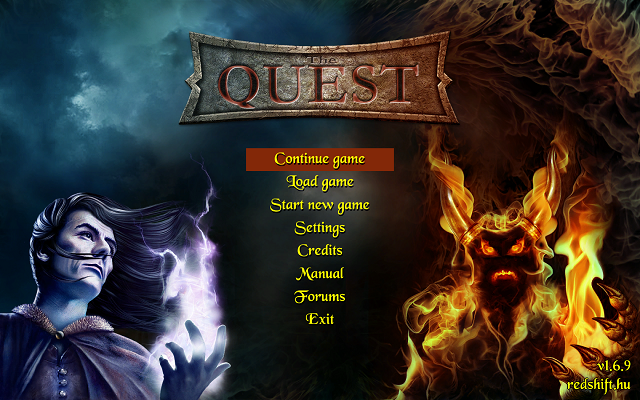 If The Quest has any direct ancestors, it’s the Might & Magic games III-V. 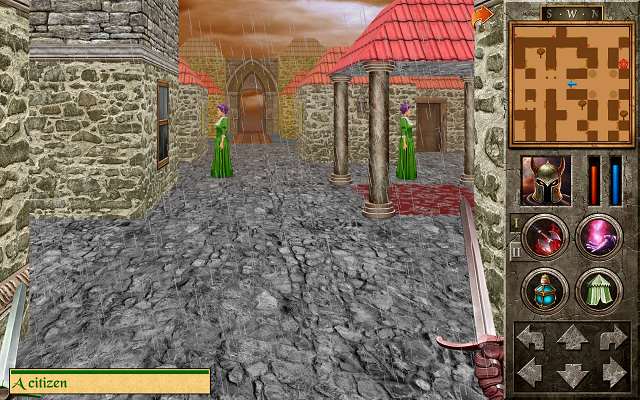 The screen layout and the general gameplay will seem pretty familiar to veterans of the series. And just as in those games, the main story really only serves to give you a reason to start the freeform exploration that is the actual main content. You do get a main mission at the beginning, telling you about the missing governor and that you should try to gain the attention of the thieves guild, which has its headquarters in Vastares, the second city you will come to visit. Trying to do so on your own will in fact achieve nothing. What you have to do is visiting a “mysterious man” who is never mentioned by the quest log, meaning you will only find him through that freeform exploration. That man will give you a series of about five quests, one of which is infiltrating the thieves guild (which takes all of two random combats) and the last of which will lead you to the game’s final area. As his tower is close to the capital, the last city you will enter on your journey, you will spend at least the first 70% of the game doing nothing to advance the main story, depending on when you find and decide to visit him; but once you have begun his quest chain, you will reach the final stages rather quickly. Adding to it, the main plot would have been clichéd in 1993, and even though it’s completely obvious that this “mysterious man” is up to no good, you have zero chance to disobey his orders or confront him about his true nature, which is somewhat weak for a game that prizes its freedom to let you do good or bad. There’s another major quest, however, that indeed emphasizes this feature. You acquire a collection of important items which you could give to several people, some of which are not even obvious as possible recipients. What they make of this and what your reward is varies a lot – some of them could use those items to become ruler of Vastares, others just want to gain money out of it. But this quest is not without a problem either: it only progresses once you talk to someone with a Persuasion skill of at least 28. I have no idea how the player is supposed to know this. Should he randomly raise the skill until the response is different? In another quest, you need a certain knowledge of Lockpicking, and the quest log kindly reminds you to return once you “get better”, which is at least something. A reminder towards raising Persuasion? Not so much. I don’t need automap arrows which directly point the player towards the goal of the quest, and I can handle tricky puzzles as well as complex conversations. But this is akin to saying “you cannot open the door” without giving me a hint whether I’m missing a key, a lockpicking skill or a certain strength value to break it open – and at the end, it turns out, I need the Nightingale of Access chirping the correct notes. The player should at least have the possibility to make an educated guess – more isn’t necessary, but it also shouldn’t be less. A better organized quest log would have gone a long way to make The Quest (!) more enjoyable. One pretty cute feature of The Quest you stumble upon right at the beginning, during character creation. There are four human races instead of elves, dwarves and so on (but with essentially the same archetype statistics); the fifth option is to play an undead. So if you are out to play an “evil” character, here you go. Being undead allows you to cast a bunch of spells not available to any of the other races, which gives you the ability to not only damage an opponent, but rather draining its life force, adding to your own. Apart from that, gameplay doesn’t change much. You cannot use standard healing potions, but as there is a “healing undead” potion right away, it comes out equal (instead of, for instance, being forced to use said drain spells to regenerate). There are few other “evil” roleplaying opportunities in the game. On a few quests, you can choose the outcome – returning an escaped woman to home even though she doesn’t want to, or tell a made-up story to their relatives. Decisions like these change the reward, but have no further repercussions within the game world. You also have the choice of ignoring all the pleas for help, basically telling people not to bother you with their absurd requests. 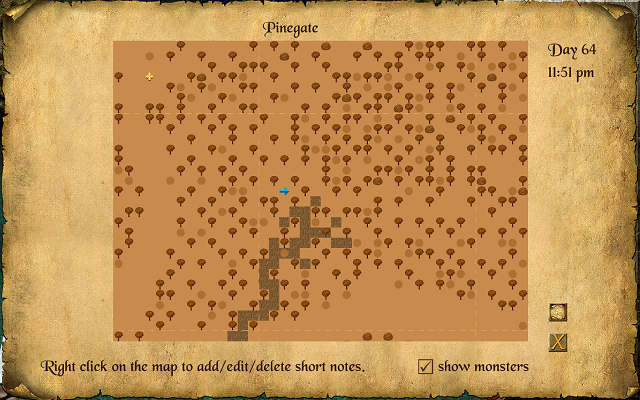 Never mind, you will only miss out on a little gold, as solving quests yields no experience rewards anyway. Yep, you read that right. Of course, the only quest you cannot deny to take on is the only one you would really want to – the main quest with the oh-so-mysterious man, as outlined above. Oh, and at the very end of that main quest you can decide whether you wish to save the world or dominate it. That’s it for being for “evil”. Alright, back to freeform exploration, which is the game’s focus anyway. The Quest gives you quite a playground. The aforementioned Might & Magic games have their worldmap structured in sectors of 16×16 squares. 24 (4×6) of them construct the game world, with some squares acting as portals to the more detailed dungeons and towns . This “different scales” approach, while rather abstract (see On Overland Travel for more detail), allows for a very efficient use of the worldmap, with a high density of action zone portals and other relevant events (orc camps that act as monster generators and so on). The Quest has its world map also structured in sectors (with a size of 21×21 squares each), but everything is taking place on the same map, on the same scale. This removes a layer of abstraction, but also means that to have an even remotely relevant distance between towns, there must be a lot of wilderness in between. Accordingly, the land of Freymore consists of a whopping 118 sectors, but most of them are pretty empty, except for a lot of trees. The advice “Don’t waste your time drawing a large forest if nothing happens there” sounds trivial, but is still true. I am of the firm opinion that the “different scales” approach would have benefited The Quest a lot. Perhaps it would have allowed the developers to spend more time on the dungeons, which are quite interesting, with traps, small puzzles and what you have come to expect, but end up being rather small. There’s nothing in the game that comes even remotely close to the “Lost Souls Dungeon” or “Castle Basenji” from the Xeen games, for example. There is one advantage to the vast outdoor area – it leaves place for huge amounts of alchemy ingredients to be spread throughout. I must admit I never used the alchemy system and didn’t feel like I was missing out on something; a solid supply of health and mana restoration potions, which can be purchased without a hassle, was more than enough to beat even the dragon king pretty easily. This is a part where I can really get behind The Quest. We probably had different reasons to think about this process; my inspirations were the inns that dot the landscape of Skyrim: They look so cozy, especially when you are wandering through a snowstorm in deep night, but in game terms, there is absolutely no reason to use them. What a waste, and what a missed opportunity to create some “warm home versus dangerous wilderness” atmosphere. In The Quest, resting in inns provide a definite benefit, as it lets you start into the day with a noticeable (temporary) bonus to your maximum health and mana. Recommended before exploring unknown dungeons. Just for fun, you can also play a little card game at the inns, a la Arcomage in Might & Magic VII and VIII. If you have enough patience, this allows you to break the economy, as you win about 90% of the games. Now you can certainly also rest outside, at any time. You generally restore health and mana to maximum levels, but it can also happen that the weather conditions become unfavorable (in other words, it starts to rain), which lets you wake up with only about 70% of those values. In practice, though, this only leads to abusing the quicksave feature. This could be circumvented if the weather wasn’t generated on the spot, but, say, two days in advance. Heh, this might even lead to a weather forecast skill… But in general, I like the idea. Another interesting part of the game, without an equivalent in older games. It works somewhat like in Dragon Age or Pillars of Eternity, but gives you even more flexibility. The various basic items have different amounts of space for enchantments (which you pay extra for – an item that is “superiorly enchantable” is quite expensive just for having that option! ), and the different enchanters sitting in the cities can actually only utilize a certain part of it. As long as you stay within those confines, you can pile up enchantments of all kind and power and combine them like you wish – a robe that gives you +10% magic resistance, +15 health points and +2 in three different magic skills? You’re welcome! This freedom in artifact creation probably has its closest equal in 1994’s Master of Magic (and similar fantasy strategy games). In CRPGs, you are usually bound to embedding crystals, runes or other power sources into empty artifacts – please say hello to Diablo II and Dragon Age – Origins. This sounds like a disadvantage for the player at first (well, it is), but it has two gameplay benefits: As those power sources are usually only available in finite numbers, the player has to make more decisions about their allocation, and they are another group of treasures with which to spice up material rewards. To sum it up: I had my fun with The Quest (otherwise I wouldn’t have played it to the finish), but I am certain it could have been improved upon in the said areas. For us indie brewers, there are some interesting ideas to build upon, but also some traps into which one can easily fall (many, many projects have never even been completed because their creators wanted to make the gameworld big just for the sake of being big).